Nomad Compose, a dual-tipped paintbrush and stylus for the iPad and other touchscreen devices. 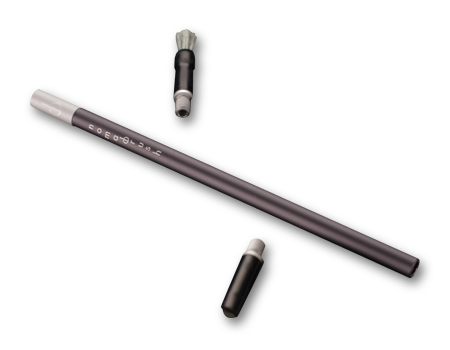 The Nomad Compose (TM), an interchangeable dual-tipped paintbrush and stylus for the iPad and other touchscreen devices. The Nomad Compose is beautifully hand-crafted using precision-milled aluminum parts. The brush tip is 0.4" long, and is a blend of natural and synthetic fibers. The Glide Bevel Tip (TM) is 0.5" long, and is made of the same brush material, allowing a truly friction-free stylus experience. The unique dual-tipped design of the Nomad Compose ensures that you can quickly access the preferred tip for creating your digital masterpiece with your favorite painting or drawing app. Includes Charcoal Grey Aluminum Handle, Short Brush Tip, and Glide Bevel Tip (TM).